Most computing devices have limited life span due to mechanical wear, technology obsolescence, or slow access speeds. Instead of just sending these to a land fill or for recycling, you need to first make sure that the data that was stored on the storage device is no longer accessible. So here we are going to examine methods for data destruction and disposal. Physical destruction of computer media components ensures that the data is unrecoverable. Effective methods includes using a shredder, incinerator, drill or smashing the platters completely to change the physical make up of the component so that it can not be reassembled or recognized. Other methods includes using a degausser to demagnetized the internal components of the device so that they are unreadable or using a electromagnetic waves to alter the magnetic components inside the device so that they unreadable and unrecoverable. 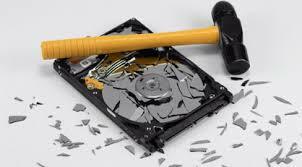 Often times third party offers data destruction services and present the owner or client with certificate of destruction upon completion. This certificate is meant to be auditable record of the data’s serial number o f the destruction drive, the method of destruction used and more. Before you officially dispose data storage devices it important to make sure that the data is not recoverable. Wipe the storage device using a wipe disk utility. In this method, all the existing data/information will be overwritten with all zeros. Remove the storage device from computer or any other device. Use one of the following methods to physically destroy the device. Drill through the platters on a hard drive in multiple locations. Drill through the removable media in several locations. Pulverize the physical media in a crushing machine. This is usually done by an outside vendor, most vendors will do this on site so you can verify the media was actually crushed. Finally smash the device into fragments. Disk formatting is the process of deleting file system from a computer device in other to clean the computing device for reuse. Proper formatting should be done to prevent any data remnants from being accessed on the devices. This process can be done in two ways. Low level formatting : this is the process of writing track sectors marking on a hard disk. This level of formatting system is performed when the device hard disk is manufactured. Standard formatting: Also called high level formatting, in an operating system function that builds file system on drives and partitions. It tests disk sectors to verify that they can be reliably used to hold data. It marks any unreliable sectors as bad sector that can not be used. As a best security practice, standard formatting should be employed to ensure that most data is removed from a device. However some forensic tools may be able to recover data even after it has being formatted. To truly ensure that all data are erased from a device, while keeping the drive reusable, you need to securely wipe it. Raid Fast Data Recovery Technology.